A light drizzle and relatively cool temperatures greeted a small group of hikers at AHS. Iva Gillet injured her knee while hiking the week before, so Andy Willgruber filled in as hike leader. A combination of factors made this hike more of an adventure than normal. Besides the weather, long drive, and length of hike, a big question mark would be the condition of the Shenandoah Mt. 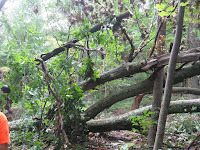 Trail after the derecho storm. Key exchange logistics and timing would also add to the uncertainties. This undaunted group of hikers (Beverly and Pete Fink, Eileen Seaman, John Brandt and Anne Colgate) would not be talked out of this hike despite the uncertainties and the sure promise of a very late return to AHS. Two vehicles headed to Braley Pond in western Augusta to meet Michael Seth an hour later. Upon arrival, Michael told us that this would NOT be a key exchange hike! 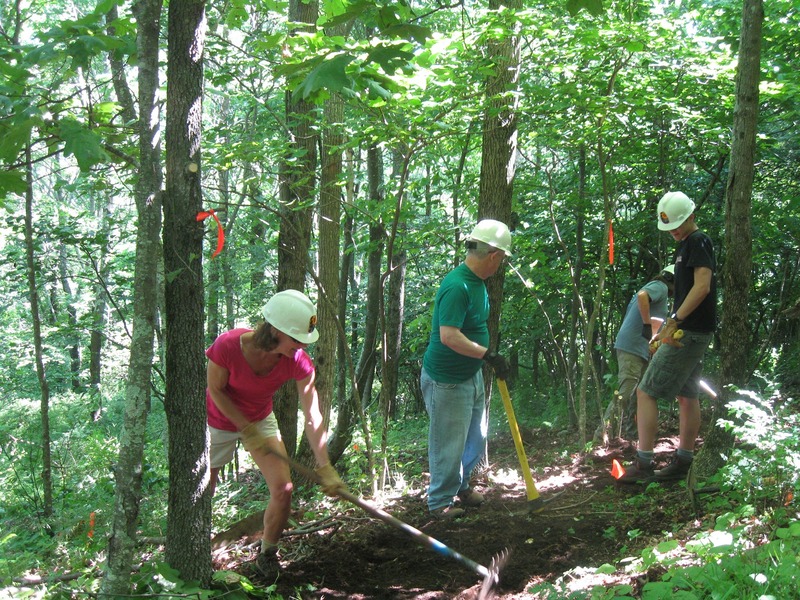 The Southern Shenandoah group were just going to work clearing the trail at the northern end. If we were able to hack our way through downed vegetation and make it the almost 11 miles to the end of the trail, we would have the use of Malcolm and Lynn Cameron's pick-up truck to take us back to Braley Pond. The substitute C-ville hike leader realized that he was the victim of a friendly scam! This was clearly a SSVC work trip and they simply needed more bodies. (Michael and Iva, I don't get mad but I will get even! :-). We drove two cars up to the Confederate Breastworks on US 250. A limited amount of tools were handed out and we proceeded north on the trail from there. The first three miles of our relatively level ridge top hike were pleasant. The SSVC had previously cleared this section. We spotted a number of wildflowers, all of which Michael knew(but I can never remember). From this point forward there were contiual blowdowns blocking the trail. We got started on our day's work and stopped for a quick trailside lunch in the middle of our fun. We resumed our work with the tools we had. Sometimes we just used bare hands and brute force. 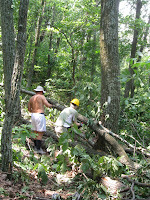 The C-ville PATC cleared about two and a half miles of trail! But with each blowdown cleared, concern mounted about our slow progress and the miles yet to go. Just as talk of mutiny was gaining traction, five members of SSVC appeared. The trail was now completely open...and, lo and behold, keys WERE exchanged. We handed over two keys and received one for the Cameron's truck. We continued on enjoying the experience of simply hiking, sometimes in a ghostly fog. Our hike ended at Forest Road 95 on the Little River. As only six people could fit inside the truck, the C-ville hike leader jumped in the truck bed. John Brandt would drive. We drove the short distance up to the pass over the mountain to get turned around and to visit West Virginia. From there we careened (that's how it felt in the truck bed) down the gravel road along the Little and North Rivers to return to Braley. Just as we arrived there, the rain began falling in earnest. So the truck bed passenger was appreciative of John's swift and sure driving despite describing the experience as "like riding backwards on a roller-coaster that went on for way too long". About 15 minutes later, the SSVC group arrived with our two cars. At this point, Anne headed directly home to Nelson County, possibly to a very worried husband (we hope not). To honor Beverly, our "director of trail operations" for the day, we all piled into Andy's car and headed to Beverly St. in Staunton to Baja Bean. Michael, Lynn and Malcolm joined us for tasty Mexican food, good beer and great hiking stories. One more part of the day's adventure remained: the drive through the rain and fog over Afton Mt. The hike leader (and driver) prepared for this by limiting himself to one beer at dinner (by far the most difficult thing he did this day!). A tired but happy group of adventurers arrived safely back at AHS around 9:45 P.M.
From time to time within PATC, I hear stories of the dedication of some members to the mission of having good trails in the PATC area and to the associated activities of PATC. For some years, Andy Willgruber has kept the summit of Little Calf Mountain open, using his truck and chainsaw skills in a combination that for years no one else in the chapter had. In the last few years, Don Davis has dedicated many hours and his skills to working at Dunlodge Cabin, relieving the workload on Andy keeping Little Calf Mountain clear, and in between, helping with regular trail maintenance. 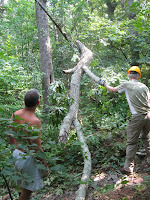 Nevertheless, after announcing on July 2 that the Chapter’s section of Appalachian Trail had 31 blowdown sites, and 16 were chainsaw sized, I was surprised when Don Davis said he could cut fallen trees with a chainsaw on July 4, 6, 7, or 8 and Andy asked when he should help. Brad Young said he was glad to help carry chain saws and other equipment, and move large logs, even if it was 100 degrees. 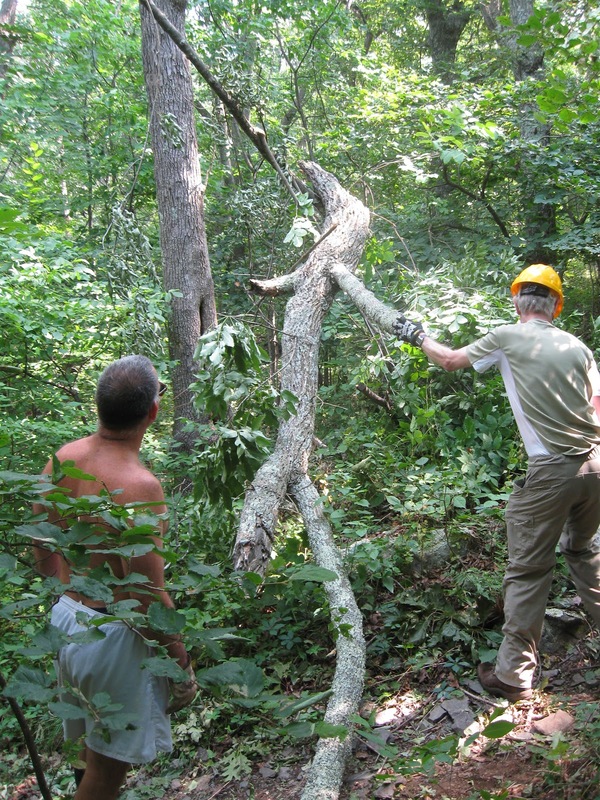 The willingness of these people to give hours of their time and years of experience is why our section of Appalachian Trail is largely cleared of the worst damage in over 25 years. As the weekend approached with 100 degrees forecast, the southerners, including District Manager Don White, said that we could cut trees in that weather, but others prevailed in the view that it was too hot. However, Don White said he had arranged to meet some overseers, and wanted help on July 7 in removing one blowdown north of McCormick Gap, so I reached out to my way-south origins and went to help. Before meeting Don White, I damaged some bittersweet that may have been a factor in one tree falling and did a little tidying on a couple of the major blowdowns. After helping Don White with a small but messy blowdown, I soon was watching my air conditioner run. 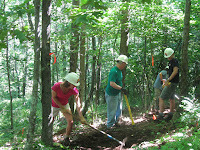 On July 15, the clearing crew, all wearing hard hats, assembled near Rockfish Gap. We put a car at McCormick Gap in case we were able to clear all or most of the trees and walk to the northern end of this section of trail. This area seems to have suffered more storm damage than elsewhere in 50 or more miles of the park. 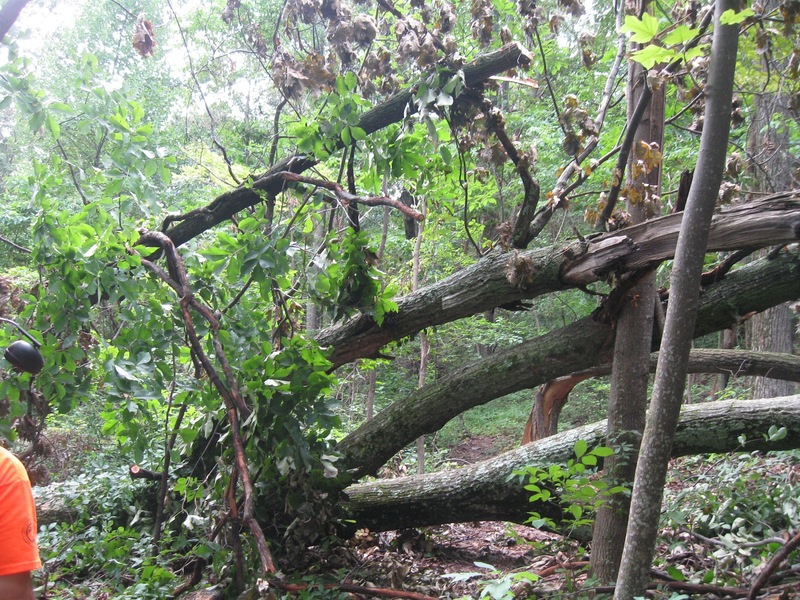 The first blowdown involved three tangled-up trees. This site did not have the largest tree but had the most complex situation, with ten problems to solve. Andy and Don thought about what might happen, drawing on their years at the school of hard knocks and the weekends they spent in chainsaw classes, and then started cutting. 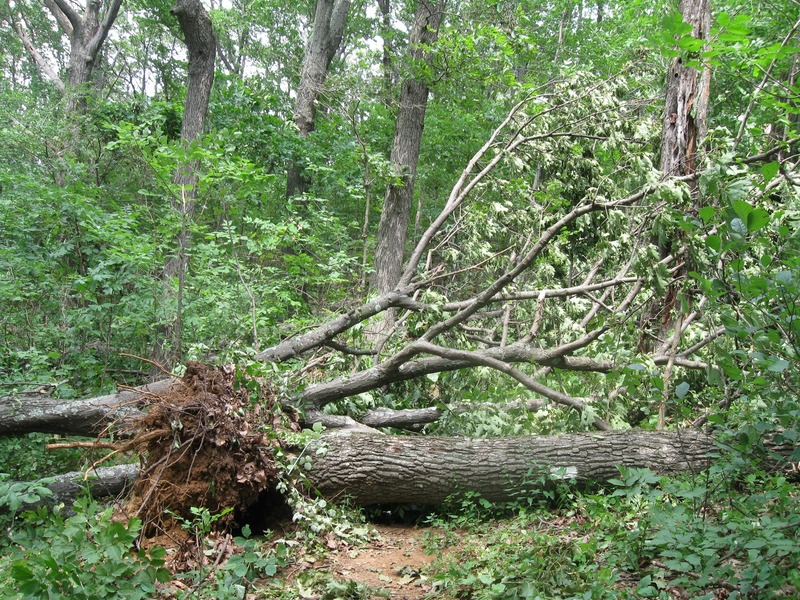 The trees fell where we wanted but did grab the chainsaw a few times. Andy had brought his chain saw in addition to the PATC saw, and the second chain saw simplified reclaiming the stuck saw. 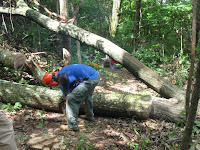 Brad moved logs with enthusiasm and strength and did some hand clearing. I spent a few minutes damaging bittersweet in the hope of slowing damage from this tree killer. After the first couple of blowdown sites, the work became more conventional. However, all the work took its toll on the chain of the PATC saw, which had led a hard life. So we were down to one saw sold for home use, so we took extra care to ensure that it did not get stuck in the logs. Finally we reached the monster: a log 30” top to bottom. Don cut a couple of smaller parts, one of which was hollow. However, when the time arrived to make the biggest cut of the day, the saw was getting hot, and further use might have broken the chain. The crew, if not hot, was wet, thunder sounded in the distance, and one member said he needed to do some things at home, so we turned around. After hearing District Manager Don White mention a case of an experienced chainsaw operator causing a scare when fatigue caused a miscalculation, I was again glad for Don Davis’ wisdom, also displayed at Dunlodge, in knowing when not to try to do more. 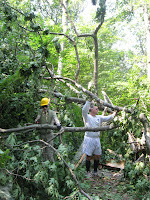 Then we met Don White, who had said he was coming both to help us and to get help removing a large tree further north. Besides assembling reports on the storm damage, Don has made some trips from Richmond to remove some of it. On this day, unexpected events delayed his arrival. 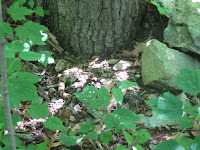 During the day, I saw three people whom I had seen on that trail section two weeks earlier. Two of them admired our progress. Later, I met two Australian tourists. So it was a very successful day. No injuries. 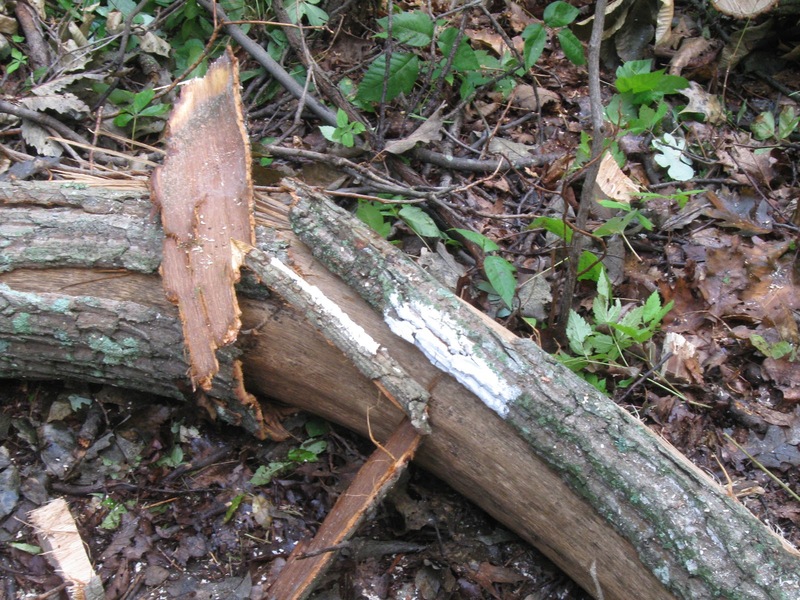 And no scares, thanks to the skill of our chainsaw experts. 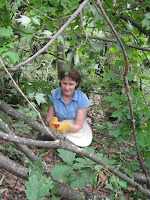 We cleared a lot of big, tricky trees. Don White—who oversees 40 miles of AT, runs a trail crew, and was PATC supervisor of trails in the past—was impressed with the word we’d done. The areas we cleared looked very different with the fallen trees removed. 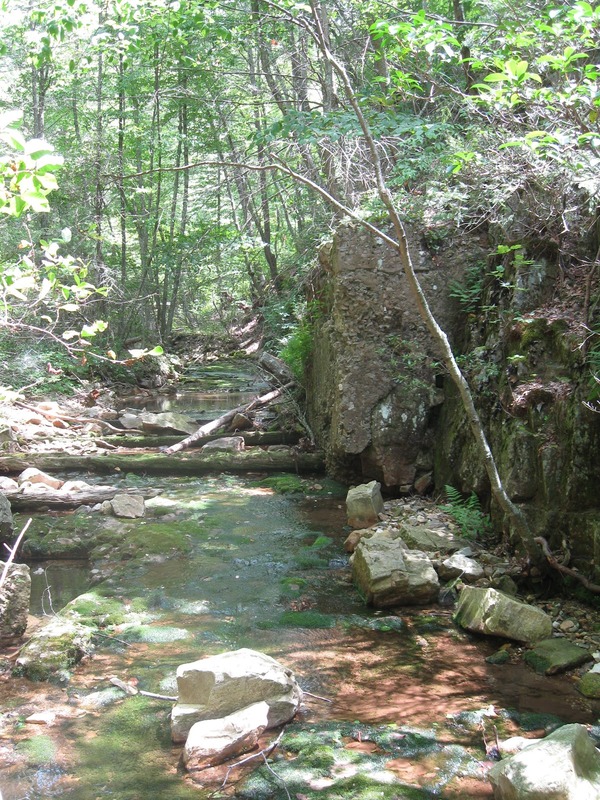 It’s summer and time for a hike with water: today, the pool on Riprap Trail. For reasons involving food, I shortened the route from 10 to 7 miles with car shuttle and was surprised that only John Brandt and Neil McKinney showed up. After I had backed out of my parking spot, last-minute arrival specialist Norman Beil drove in. We got to Wildcat Ridge parking area earlier than expected and, uncharacteristically, Michael Seth arrived later than expected. Despite three Ph.D.s, we finally did our initial car shuttle and started hiking. On the way down, we had the normal great views of the Shenandoah Valley, which John Brandt photographed for a class project. 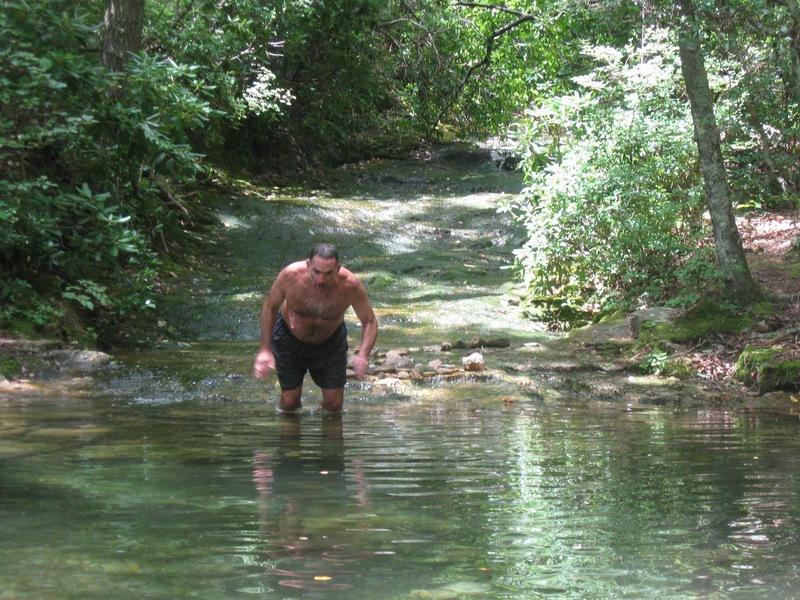 At the classic swimming hole, I was the first into water. Neil also ventured in. Neil has worked in health care, so I was not surprised to see that he also does not believe in subjecting human bodies to thermal shock of quickly immersing a hot person in cold water. 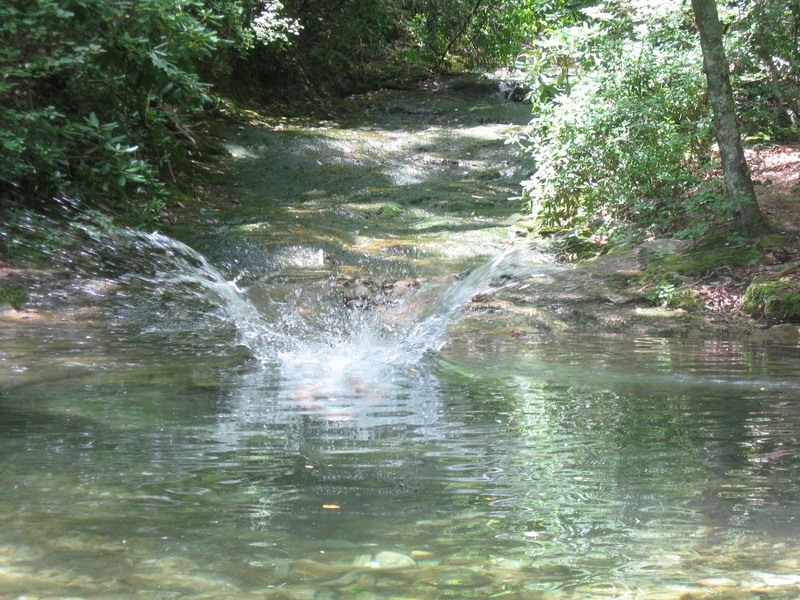 Then Michael Seth went in, and of course John went in, with a splash. On the way up, we saw a little storm damage (none on the way down), and then met a family of three bears who live on Wildcat Ridge Trail. 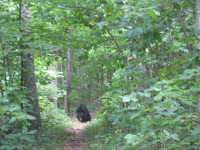 After two of us stopped to look and photograph the bears, the mother started walking toward us. 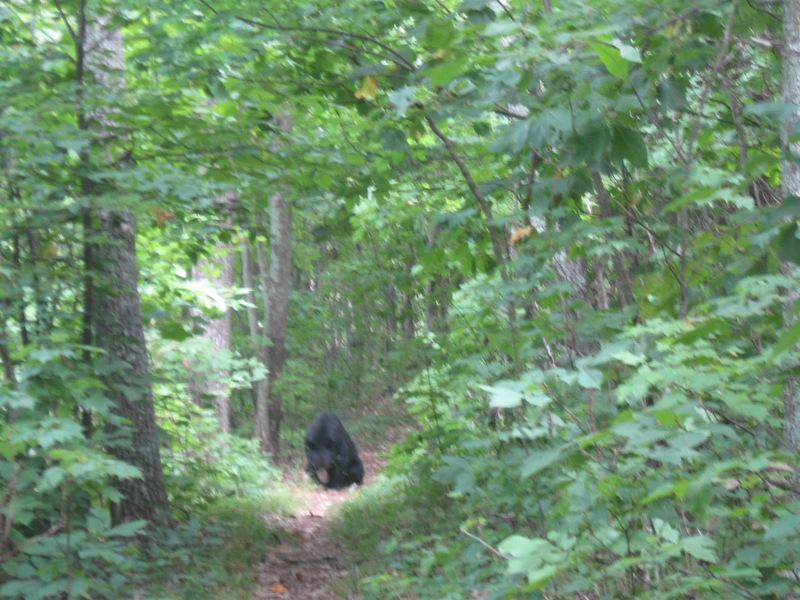 Then four of us slowly and noisily moved up the trail. We stopped while a cub came down a tree. The bears finally walked away, and we moved on. Michael and I recovered the car at Riprap while the others looked over the Piedmont with Norman’s binoculars, spotting buildings in Charlottesville. Our next adventure involved how much fuel was left when a car’s low fuel light comes on. My excuse for overlooking the low fuel was lots of recent trail work trips, and work. After some discussion, the decision was that with considerable downhill, we could reach Waynesboro, only to find that the first two pumps did not dispense fuel. The rest of our trip home proved uneventful. In spite of the dire heat predictions 7 PATC hikers: Ken Moss, John Brandt, Liz Lyons, Eric Christenson, Leon + Bailey and Bev & Pete Fink left Charlottesville for Graves Mill where we met Michael Seth and began our climb up the Staunton River Trail. The hike was originally scheduled to go to Bear Church Rock but weather warnings prompted a change of plans. 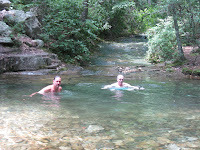 We would hike up the Staunton River Trail until a cooling pool appeared and then take advantage of it. The trail started out warm and within 30 minutes we were in the water. 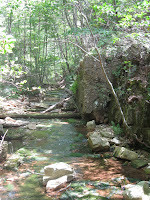 Continuing along we intended to have lunch at the stream near the McDaniel Hollow Trail junction. When we got there the stream was dry. 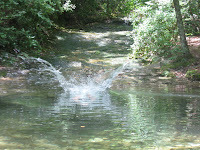 The consensus was to go up further to the Stanton River Crossing. The character of the trail changed from the old road to a soft path through shaded woods where all memories of the heat disappeared. 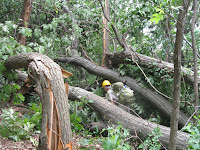 Thanks to Eric’s foresight in bringing a saw along, several downed trees were dealt with quickly. Before long we arrived at the lunch spot which proved to be an excellent choice…shade, cool water, mossy rocks and butterflies. 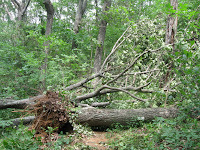 After enjoying a relaxing lunch, we continued up the trail to the next crossing which was impeded by an extremely large downed tree – to big for Eric and his saw. At this point Ken said, “this is the wrong direction for beer”. With that we turned around and began to retrace our steps until Ken and Liz spotted a large and deeper pool which no one could resist. After another soaking we headed down toward the cars, the temperature rising as we dropped in elevation. Arriving at the trail head several in the group couldn’t pass up one final dip in the Rapidan before boarding the cars and heading to Timberlake Grill to rehydrate and replenish our energy stores. 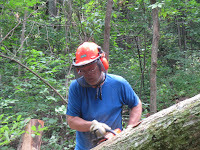 One day we help hikers with an injured dog, and the next day John Brandt arrives at just the right moment to help us clear many blowdowns on the club’s section of the AT. John drove up to Rockfish Gap about 2 minutes before we would have left to shuttle a car to McCormick Gap. John Brandt, who had actually showed up to do a recreational hike, nevertheless said he’d pitch in to help clear the trail. John Brandt contributed his customary energy and perspective on how some obstacles could be removed, always trying to save small trees. He helped clear at least 10 blowdowns then joined us for lunch before heading off for his originally planned activities. 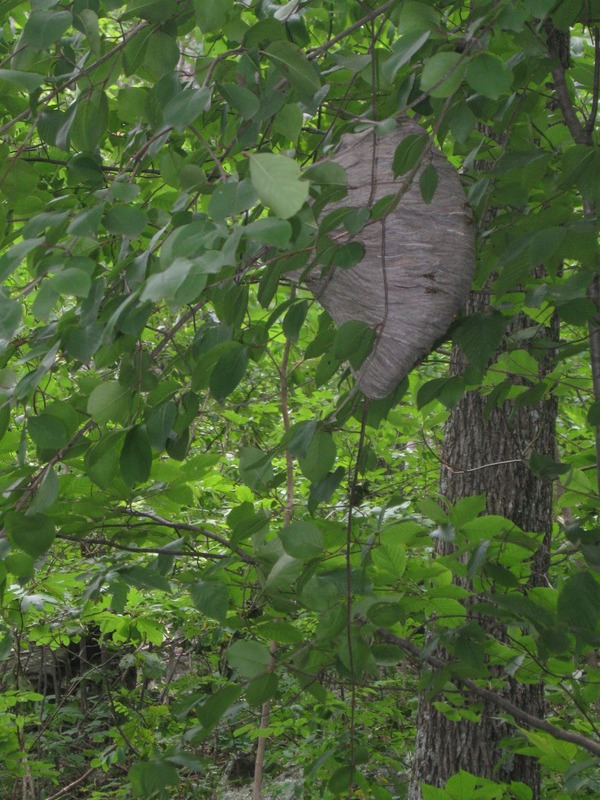 Shortly thereafter, the remaining duo came upon a humongous wasp’s nest. 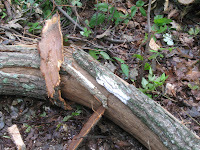 Then, at 2.65 miles from McCormick Gap, we found a 30” diameter fallen tree. We cleared some small branches and a poison ivy vine to make it easier to climb over and added it to the “chainsaw needed” list. About quarter of a mile from the end, we found the tree a couple of hikers on Saturday called impassable. It was messy, but after cutting a hole in the leaves, we got through. Originally intending to work a half-day because of the heat, we reached the end of the trail after 3:30 p.m. Altogether, we counted 29 blowdowns, some of which involved multiple trees. With John Brandt’s invaluable help, we had completely cleared 16 of the obstructions. 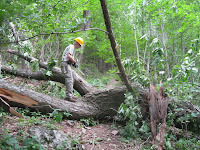 For the remaining 13, we cleared what we could and left the rest for chainsaws.John thinks this is the heaviest damage on this section of trail in the last 25 years. It also has more damage that some other sections of AT. 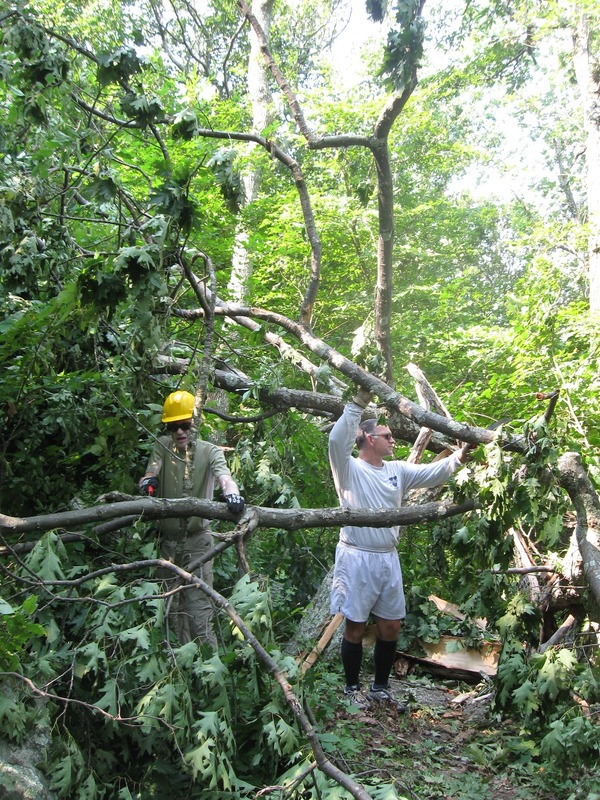 We were both tired and one-half of the crew was also mighty hot, but we were happy about how much work we’d done: 3.4 miles of trail largely cleared less than 48 hours after a major storm, and done on a day with a heat index of 94 degrees. 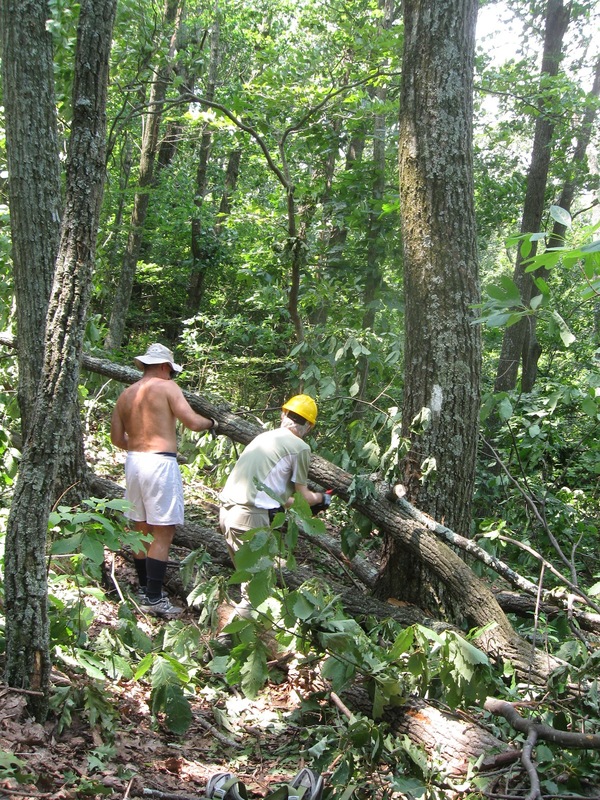 Meanwhile, Don Davis, with chainsaw at the ready, Andy Willgruber and one or two others are standing by waiting for not so hot weather to clear the large trees that we couldn’t conquer with handsaws. 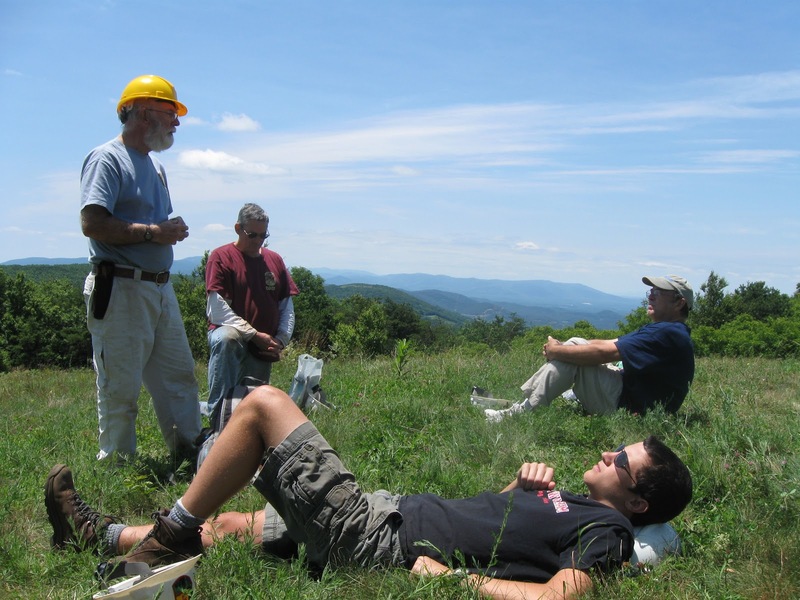 PATC’s primary purpose is to maintain the Appalachian Trail. 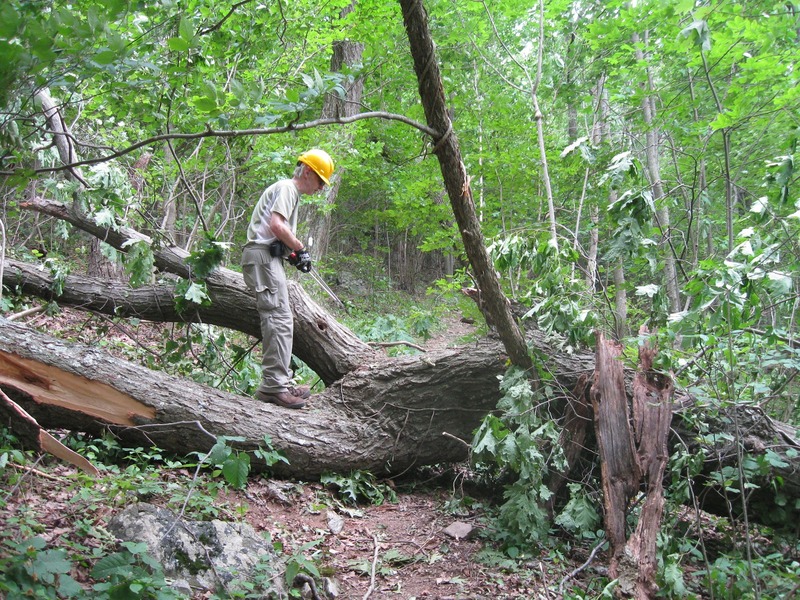 This mission goes beyond cutting grass, removing fallen trees, and other pieces of standard trail maintenance. 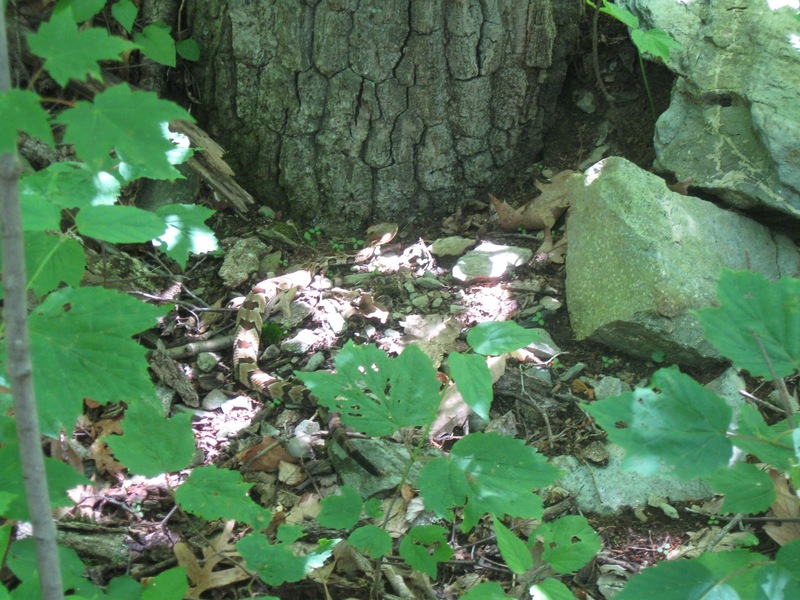 Some members advocate for protection of the trails, and some try to slow the takeover of trails by invasive plants. Others serve as trail angels, who leave water at trailheads and provide transportation for long-distance hikers who need to get to and from the trail. 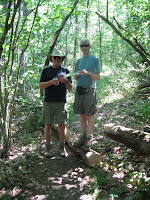 On June 30, Marian Styles and I (John Shannon) provided a mixture of trail service. Despite the forecast of scorching weather, we headed to Rockfish Gap to remove some weeds and look for damage from a strong, destructive storm on Friday night that packed wind gusts of some 80 mph. We found a couple of messy downed trees, which were 5-minute cleanups, and were wondering where the big one was when we saw three backpackers heading toward Rockfish Gap. One of the backpackers was carrying an injured dog in his arms. Greta, a very cute pug who was a veteran hiker, had been wandering outside the view of her human caretakers and came back limping. This was not an auspicious way to start a 43-mile hike to South River Falls. We abandoned trail work and went into dog-rescue mode. Marian tried to get Greta an appointment with a vet in Charlottesville, but alas, there was no room at the inn. So we all piled into my trusty Camry and headed for the trio’s car, which was parked at South River Falls, so they could get home to New Jersey with the injured Greta. En route, they called their home vet, who said to keep Greta off her injured paw but that there was probably no immediate crisis. During the drive north, we found that car cup holders make a good place for a dog’s paw when the dog is situated belly-down on a lap. After dropping off the three delightful “New Joiseyians,” Marian and I headed back to Charlottesville to escape the now-obvious heat, with thoughts of going back to Charlottesville PATC’s section of the AT the next day to survey the damage. Summer and waterfalls go together, so hike leader John Shannon appropriately chose South River Falls for PATC’s first hike of summer 2012. A small group joined John today, consisting of Ken Moss, Liz Lyons, Marian Styles, Lindsay Brown, Eric Christenson, and Eileen Seaman. A special treat today was that Wanda Hamlin met us at the South River picnic grounds. She walked with us as far as the turnoff for the falls. Lindsay had left his car so that he, Eric, and Eileen could hike 7 miles; the other four opted for a 10-mile circuit. The waterfall was lovely, and we paused to take in the atmosphere and to grab a snack. John expected that we’d stop near a cemetery for lunch, but when we got there, we found it more overgrown than we’d ever seen it. We pressed on and finally opted to lunch in a wide spot in Pocosin Trail. Later, we stopped to check out the remains of the Pocosin mission. We saw no bears today, but a rattler that blended into the trail provided the day’s wildlife excitement. Ken nearly stepped on it (where is snake-charmer Rita when you need her?). Along the AT we stopped while Ken and John cut a knee high log across the trail. The afternoon heat prompted the 10-milers to stop after the hike at the Timberwood Grill for cold drinks, where we extended the day by sitting outside enjoying refreshments and conversation. The continuation of the relocation project began with sad news. We learned that André Dahler, a member of the Flying McLeods trail crew, had died the day before. André was on most Flying McLeods trips with his father, Al Dahler. At his memorial service, a picture of André with the Flying McLeods and his PATC Hawksbill award were prominently displayed. The good news is that nearly everyone arrived by, or very soon after, 9 a.m. While crew leader Don White waited for a couple more people, everyone else headed to Little Calf Mountain, taking the existing AT. At the top, the plan was to start building new trail to meet up with the trail we had constructed previously. This plan was disrupted by the absence of clear signs of where the trail should go, something we had noted a month or so earlier while hiking there in rain. Someone/thing had removed the pin flags and other flags marking the route. Andy Willgruber, who was told to direct people to the trail because of his familiarity with the area from his many hours of mowing, headed down an old road to meet up with the new trail, and then at the urging of PATC President John Hedrick, others followed and started digging along the flags that remained, continuing from where we stopped several weeks ago. Later we heard a weedeater, telling us that Don White had reached the top and was removing vegetation from the planned path. He disturbed some yellowjackets and received at least one sting. At lunch, two veterans of this project offered chocolate-chip cookies and lemon-blackberry cake. The area where we dug was fairly free of rocks, but enough large rocks to make the rock bar popular. As usual with this work, it is easy to get tired of one section and move on, but another person, after tiring of his own section, will see a need to make little tweaks to the someone else’s work. Some people drifted off to tend to other PATC business, and when everyone finished, we left hand tools near the trail for the next day. At Beagle Gap, we met Don Davis who had spent the day working for pay. Some people headed home, and others to Loft Mountain Wayside for blackberry milkshakes, and then to Schairer Trail Center for dinner. The next morning the weather was again perfect. Mark Gatewood was his usual early self and was talking to a mother and her son who looked ready for a hike. They turned out to be first-time trail builders. Iva Gillet arrived with Bill Holman and Trish Newman. The crew chief had not yet arrived, so John Shannon pulled a couple of hard hats from his car and headed up the trail with a trail maintainer from Crozet. Later most of the crew arrived but without the two Dons, who unsuccessfully attempted to drive up the access road in Don Davis’s two-wheel-drive truck. Quite some time later, we heard Don Davis arrive, with the sound of tools bouncing in a wheelbarrow that he wheeled up from Beagle Gap. 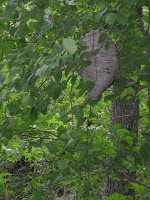 An early task was neutralizing the nest of yellowjackets as well as a wasp nest. John came armed with some stinging insect countermeasures in the form of a spray can. By now, people were in rather rocky ground, and thus using the rock bar a lot. We again had lunch on top of Little Calf, and John augmented lunches with cranberry oatmeal cake. We still had no crew chief. 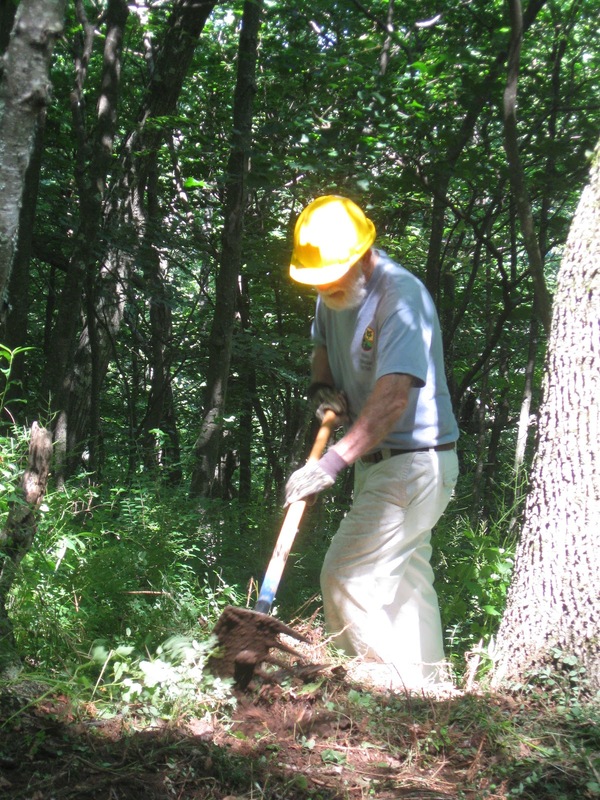 Don White had injured his knee the day before and could not climb to the summit, so he used a brushcutter to clear shrubs from part of the trail lower down. Early in the afternoon, Mark Gatewood directed people to head down to improve some sections where some further work was needed. Don Davis cut some weeds while others improved some previously constructed tread before we headed home, knowing that in July we would return to finish the job.